Today [December 20] I took in some of the “inclusive” exclusivity of the refashioned playground of Manhattan, walking the length, almost twice, of the High Line, a 1.45-mile-long park built on a former elevated rail line on NYC’s lower west side. This park is both completely delightful, with all sorts of little fanciful details utilizing the old train tracks and providing the feel of public space, and completely diabolical, in that it’s part and parcel of the present-day mechanisms of capitalist enclosure. The High Line should be an example of what people and cities are capable of in terms of social goodness for all. Instead, it supplies panoramic views on all sides of what soon begins to feel like an open-air museum of the most avant-garde architectural feats in housing for the ultra-wealthy. The park also serves as a “backyard” for these exclusive, enormous apartments, which appear to be plucked from the pages of the latest in high-end interior design magazines, and are characterized by an abundance of large windows facing directly on to the High Line. Park police nonchalantly saunter along the High Line, mingling with the other strollers, ensuring that the vantage point from the surrounding homes only includes those who look and act the part of this nongated-gated neighborhood. The park seems to work overtime at convincing all those who come for a visit that it offers refuge from the crassness of business, big-city stress, and inequality. “Indigenous” plants reminiscent of vacant lots grow up, as if organically, through the made-to-look-vacant rail lines. Perhaps one can play at hobo, freed from urban life and all responsibility? No wait, at one turn of a corner, there is a large expanse of plate-glass window embedded in the train tracks and a mini amphitheater next to it, so one can relax and spectate on the metropolitan spectacle that one is also a willing participant in. The landscaping asks us to imagine that we can all slip into mirth and playfulness, all feel edgy and youthful again. Wooden platforms on rusty wheels, for instance, are transformed into lounge chairs that can be gleefully pushed along the former train tracks; kids, couples, and family can snuggle close on these rustic seats to take selfies on cell phones or show off their hippest fashion, while gazing across the park’s railing to the upscale restaurants and boutiques on the street below. Some “street artists” are sprinkled liberally in another area of the park, under “gritty” metal beams, selling faux-DIY things like squatter-esque T-shirts or photos of graffiti — permitted impermissibility — even as “street art” that looks more like circus-tent decor can be found (& photographed!) in little pockets of this linear park, conveniently stretching from one trendy shopping district to another. And yet, the pale-calm palette of plants quietly lining either side of the High Line coupled with the gentle embrace of the slight twists and turns as well as little private-moment retreat areas as you meander along this park are, despite one’s best intentions, well designed to gracefully mesmerize you into enjoyment (submission?). 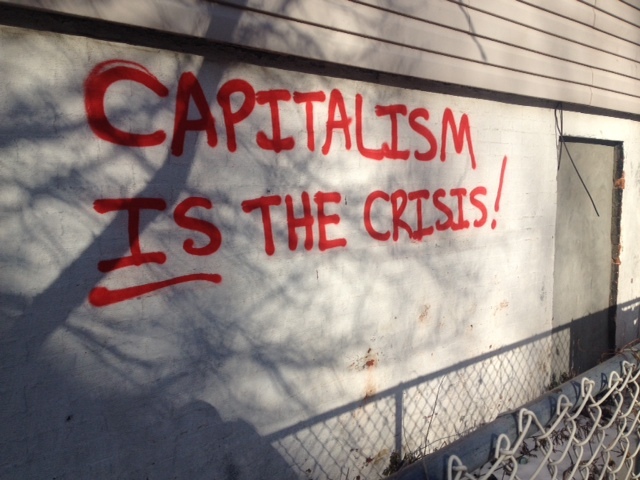 This entry was posted on December 22, 2013 by Cindy Milstein in Art & Culture of Capitalism.